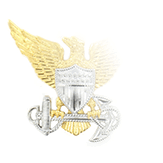 The design of the insignia for the Aide to the General of the Army can be traced to 1902, when famed artist and illustrator Howard Chandler Christy developed a basic insignia that could be adapted for use by aides to Generals of varying ranks: an eagle grasping a shield with thirteen red and white stripes in its talons. 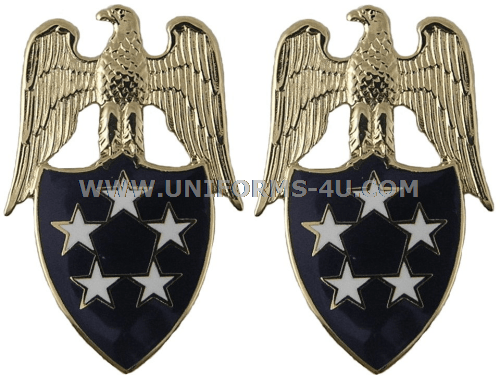 Inside the shield’s chief (the heraldic term for a horizontal band at the top of a shield) were placed the appropriate number of stars representing the rank of the general whom the aide served—one star for Brigadier General, two for Major General, and so forth. Christy’s flexible motif came in quite handy when Congress created the five-star rank of General, first on a temporary basis in late 1944 and then permanently on March 23, 1946. 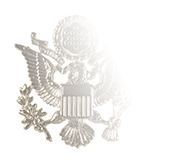 Although the Army had never had a five-star General prior to this time, the title for the new rank—General of the Army of the United States, officially abbreviated GA—was first used when Congress established it for Ulysses S. Grant following the Civil War. 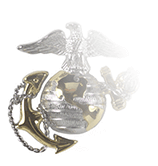 Grant, however, still wore just four stars, and his successor, William Tecumseh Sherman, ordered the insignia for the rank to be changed to just two stars with the Coat of Arms of the United States between them. Legislation passed in 1870 meant that the rank of GA was to abolished following Sherman’s retirement, but Congress hurriedly enacted new legislation that discontinued the grade of Lieutenant General by merging it with General of the Army. The revived grade was conferred on Sherman’s successor, General Phillip Sheridan, who held the rank for just over two months before his death in August, 1888. The office of GA ceased to exist upon Sherman’s death on February 14, 1891 until its re-establishment in 1944. 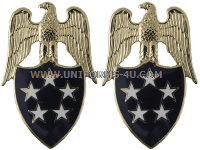 Since the introduction of the five-star rank and corresponding insignia for the Aide to the General of the Army, which was approved on 15 January 1945, there have been only five Army Generals named as GA: George Marshall, Douglas MacArthur, Dwight Eisenhower, Henry “Hap” Arnold, and Omar Bradley. 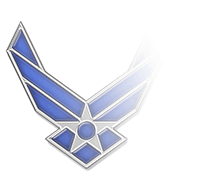 The first four in that list were all appointed to the rank over a six-day period (December 16 – 21, 1944), while Bradley was promoted to the rank in 1950. Arnold later went on to be named to General of the Air Force, the highest rank in that service, and remains the only person to ever hold five-star rank in two branches of the Armed Forces of the United States. 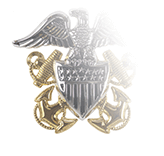 For the insignia of this and other high-ranking aide positions (President, Secretary of Defense), the red and white stripes are replaced with a blue background.